this time on the deck. Here's the view from my kitchen window, out to the back deck. I like to keep a seasonal vignette out here and change it up every year, and I wanted to do something totally different this Fall. I usually use a small barnwood wheelbarrow, but this year I grabbed a little black French wagon and added the old bushel basket and a watering can as a backdrop. Of course I had a plan! 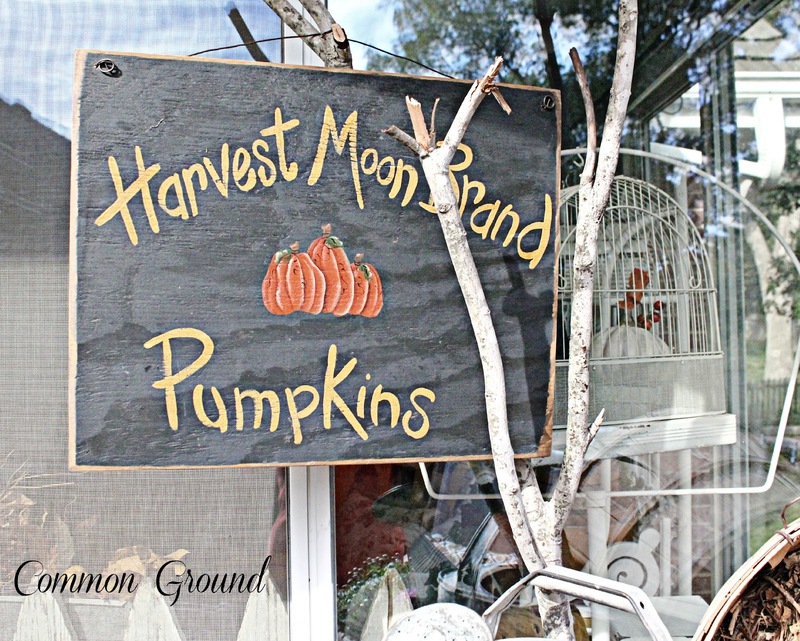 Why not just hang a Fall sign for pumpkins from it? Up until last week I still had a few straggling hummies, so the feeder has been out. If you want to read about those amazing little birds and their migration south, then it will give you a new sense of wonder about how God is so evident in nature. 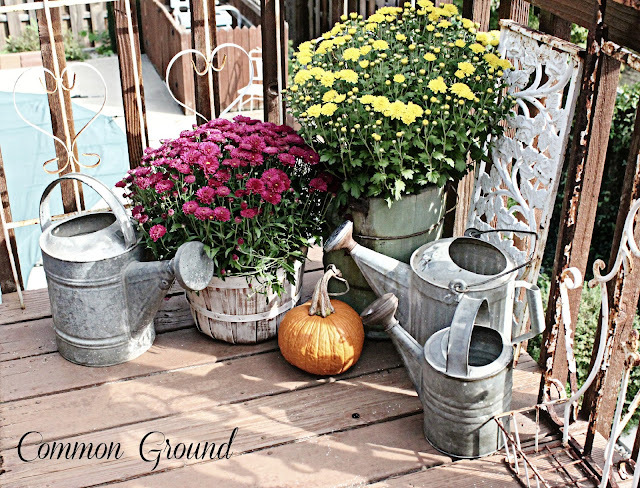 Hard to get a picturesque shot from here, but an old ice cream maker bucket and a white washed apple basket are holding a few more mums, along with a few of my old watering cans. Love the rusty patina on that old bucket. Now, the deck would not be complete without a hidden camera shot of one of my little stinkers. This little fellow and a smaller one have been sneaking around here messing with the pumpkins and eating those "preserved" leaves that you find at Michael's and Hobby Lobby. I cannot imagine that they taste good, and could even be dangerous, but they have a fascination with them. Each day there are fewer of them in the basket...yuck. This is so pretty, Debra! Sorry about your squirrel problems, but they do make a charming addition to your vignettes! Such a pretty view you have. I look forward to your posts, great photo's every time. That is such a lovely Fall grouping outside. I think that branch was a good find! I've actually bought "sticks" before at a store and thought to myself, why am I doing this???? So funny! We have a problem with squirrels chewing on our porch posts. We've had to replace parts that have been chewed! I try to sick my dog on them to run them off. Ha! Debra, what a lovely setting! Your vignette is just wonderful! Those squirrels can be pesky little things! Debra your porch looks so pretty! 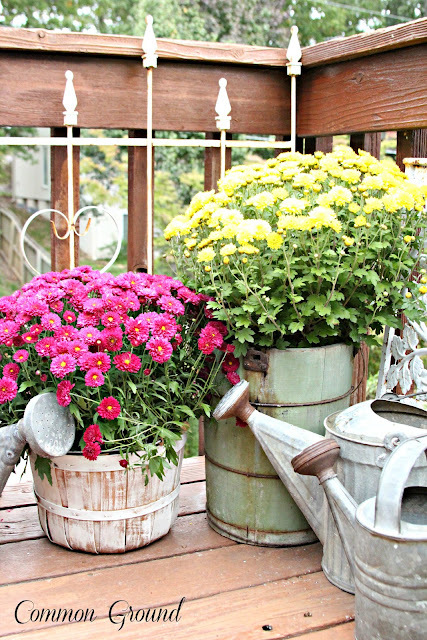 Love that old ice cream bucket with flowers.And that French wagon too! Oh yes those little critters.So far fingers crossed my pumpkins are untouched.But for how long I don't know LOL! Love the vignette squirrel and all. My little furry friends were eating my fake acorns and fake leaves too off one of my wreaths. I agree with you that can't be very tasty but they still do it. So far they have left my kale and pumpkins alone. So if the fake stuff if more appealing I say to them have at it!!!!!! Leave the real stuff alone!!!! Very cute everything. 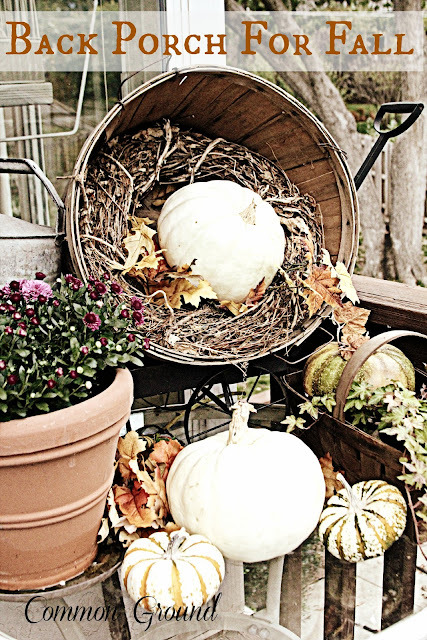 What a great fall vignette. You are a smart one for nabbing that branch. Your pumpkin sign looks fabulous on it! Very inspiring! 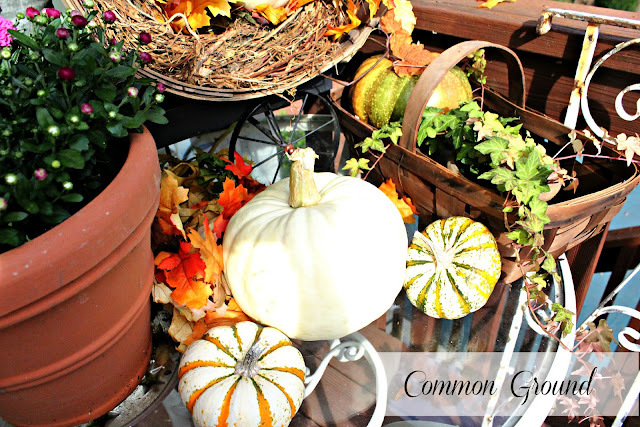 I guess I should decorate my potting bench for fall! Thanks for the inspiration I needed! I have two hummingbirds here feeding too. I have made more nectar for them. Your basket with pumpkin is beautiful. It is all lovely....I'm always looking for an old ice cream bucket for my porch. Have a great week. 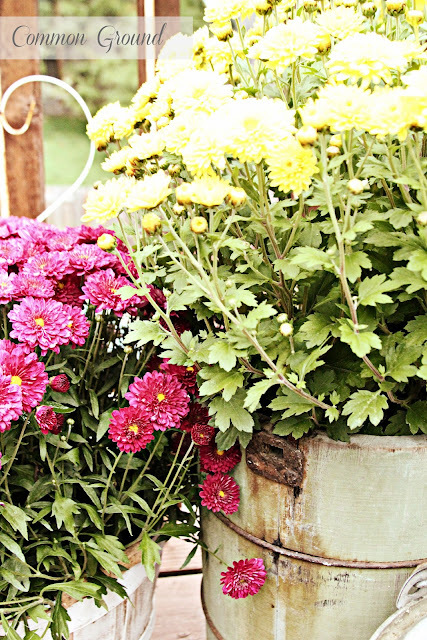 It's all just darling and I love the buckets used for the mums. Inspirational!! What a beautiful spot to enjoy all the great fall weather and sights and sounds. Even the pesky squirrel completes the picture. This is so cute, Debra! The sign makes it so charming! I have given up the battle with the squirrels, I really don't know if I'll have pumpkins this year (I say that every year and then break down and buy them!). They are cute critters though! Debra - Your deck looks absolutely beautiful. So many pretty vignettes. Love the squirrel!! It looks wonderful out there! Naughty little squirrels. This is great and so pretty. I love the accents. Beautiful deck display. Funny little squirrel isn't shy at all. What a beautiful day it is. So pretty, Debra, and I hope you get to spend lots of time out there! 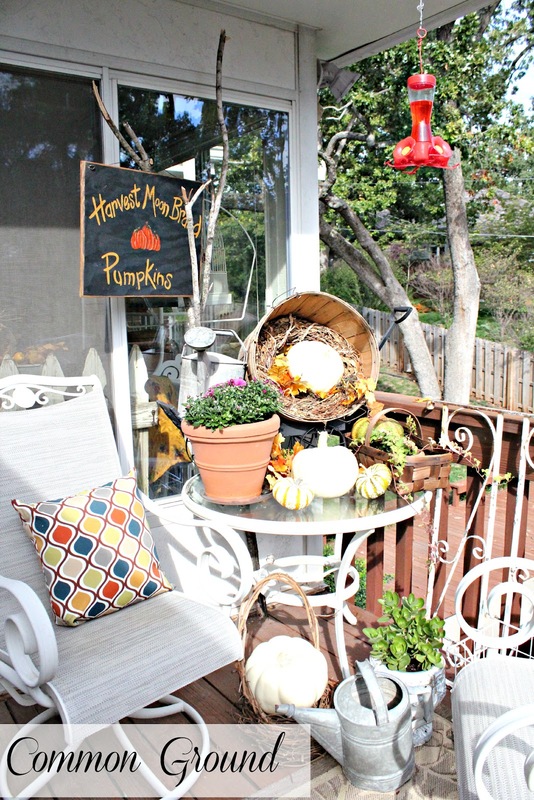 It looks great on your deck. So funny about the squirrels. I know it's annoying! Magnificient view from your kitchen window...I'd never wish to leave that spot. Squirrel watching is something "Mr. Ed" and I enJOY, too! Noticed that most of the squirrels at Bennett were gray...here on the Praire we have the red, rusty ones! Laughing...friend ~ to ~ friend...I save the fallen branches, as well!!! One is tied to the privacy fence next to the bell feeder so the birds have a place to perch while enjoying their treat!!! So pretty, Debra! And your squirrel friend is cute too. I can't put pumpkins out anymore because our squirrels make a mess. Last year there were pumpkin gooeys all over my stairwell on the front porch. I love your display ideas. Thanks for the inspiration. I thank you very nice blog. Went to the Japanese autumn is very loving Japan. Autumn leaves in Kyoto, Japan is great, among others. Please come in and search PC. 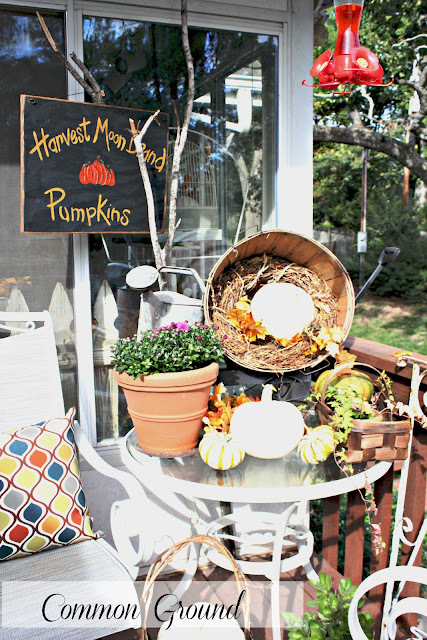 A wonderful fall vignette! Would be perfect for our Farmhouse! Your deck looks as lovely as the indoor rooms you share. I can just smell Fall and feel crisp air looking at the pictures. That is too funny about the squirrels! I love that you got a shot of theme eating! Your fall decor is wonderful, Debra. I think the squirrels make it even better...even if they are quite the pest. :) Thank you for hosting! 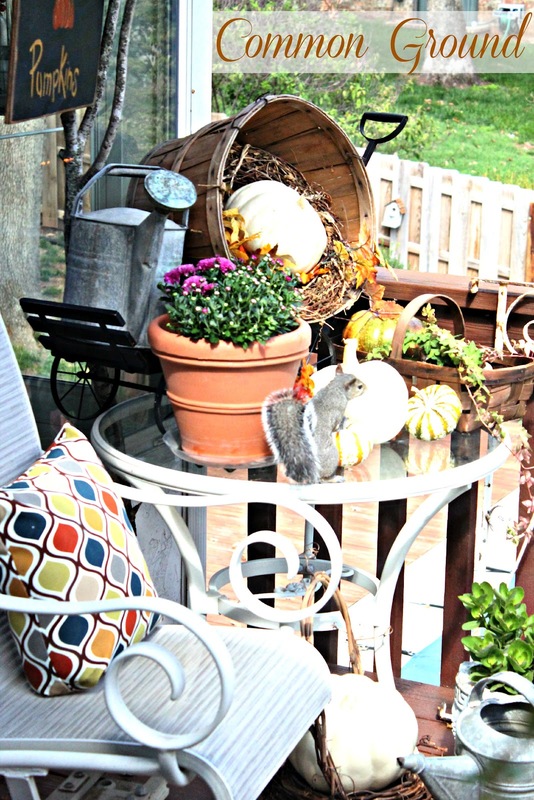 You amaze me, Debra, with your beautiful Fall vignettes inside AND outside! Thank you so much for hosting the linky party each week as well. You are so appreciated! Your back porch is looking wonderful! So many pretty colors of fall in your vignettes. 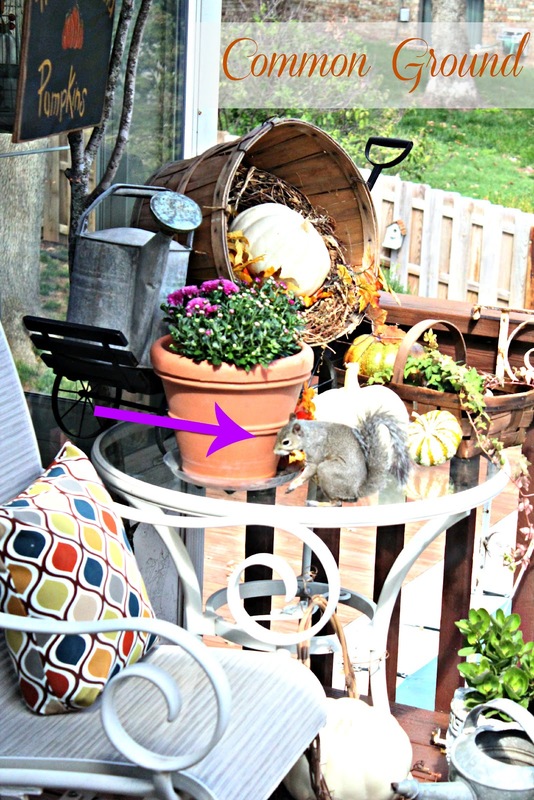 I put some raw peanuts, still in the shell, around my deck tables and gardens for the squirrels, hoping they'll eat them and not my bulbs. This looks great Debra! Love the mums with the watering cans! Thank you for joining Home Sweet Home!